I tried every medium. I had to. If I was to be an art teacher in a public school, I needed State Certification. I needed to be proficient in all media so that I could teach it. I had to know my art history and art movements throughout time. It doesn’t mean that I LIKED to work in all media, I just had to know enough to teach it. As I explored each one, I would experiment to see how far I could take it by combining one medium with another technique or using it in a way that was never done before. I came to the conclusion that there is nothing new under the sun. Someone tried it before me! So where do we go from here? I examined the progress I had made in each medium. Which of the dozens of art supplies felt natural to ME? Which one was I more eager to play in? Which was more of a struggle? Which medium fit into my ideas of expression. For instance, if my style uses line and shape, would rough lines made with chalk speak to me more than using pen lines? Or would a thin liner brush to create line feel more like my style? What if I like the impressionist style that uses overlapping short strokes to give me a pixelated painting? Then my natural medium would be pastels, even oils, acrylics and gouache or tempera. I would want a more opaque medium than watercolor, which is free-flowing and transparent. If I enjoy ‘happy accidents’ where I have to pull an idea from the way the paint flows on my paper, watercolor would suit me. After experimenting with each one, I worked in watercolors for a long time. I like the way it flows into watery brush strokes and it does its thing. 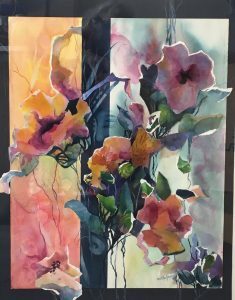 I like the spontaneity and transparency when the white of the paper comes through the paint and illuminates the colors even more. 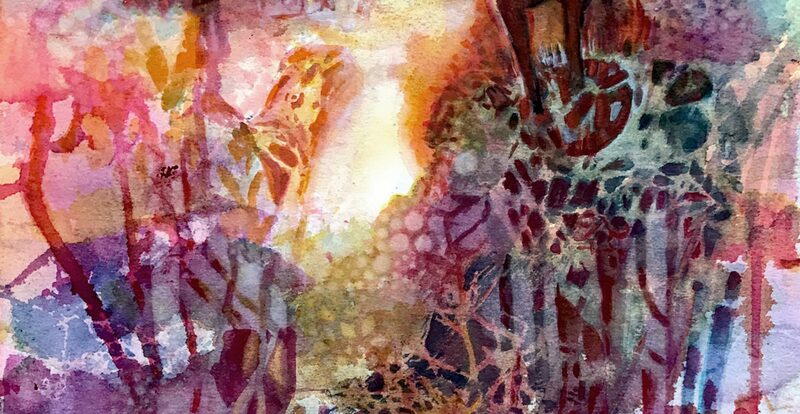 I like the challenge of conquering smooth washes by overlaying layers of color. After I became really good at my technique, I needed to expand my ideas. The worst thing for an artist is to get stuck in the same old, same old. I would be missing a lot more like experimenting with light and how it falls on objects at different times of day. I found that I like combining collage with my watercolors. How do we incorporate collage in our work? I have two drawers full of parts of prints, magazines pages and even painted paper and the paper towels I used to mop up paint on my table. Yes, I dry them and save that too. It is fun for me to dig into that drawer and most of the time my selection of collage pieces, forces me to solve my problem another way. Thus, the painting turns out so different than I planned it. This also frees me from my preconceived idea and sets me in a new direction. I am using my creative instincts to solve a problem. I might correct a problem that I was unable to erase with another coat of paint, by gluing something over it. Ha! Where there is a will, there is a way, my mom used to say! Once, I actually tore apart a watercolor I hated and used the scraps to create a new painting. King’s Garden was the result. It is in my gallery. Every work I do is dedicated to God. I thank Him for my talent and for Eternal Life because I believe by faith, in Jesus dying for my sins. I am forgiven and at peace. How can I explain the JOY I have inside me except to say it is because of my personal relationship with God, not due to religious doctrine or because I may belong to a church. Those are good on their own, but they do not replace knowing God in a personal way like you know your best friend. It is a deep trusting, true relationship that I have with Jesus. This is always available to you also. Ask Him to reveal himself to you personally then believe He will do it his way.